Home » The Law & You » I Made My Own Will. Is It a Legal Document? I Made My Own Will. Is It a Legal Document? A viewer had created his own will and signed it. But when he dies is it a legal document? Is an attorney required to transfer his assets? Our estate lawyers Greg Fellerman and Ed Ciarimboli know these answers. 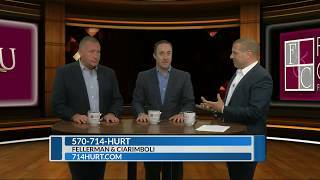 Dave Kuharchik: We have a question tonight about a will in this edition of “The Law & You.” We’re back tonight in the virtual law center with Attorneys Greg Fellerman and Ed Ciarimboli. Guys, thanks for being here. Ed Ciarimboli: Thank you for having us. This is actually a really interesting question. Dave: It sure is. We’ll get to it and find out what’s going on from one of our viewers. Jason in Swoyersville says, “I made my own will and signed int. When the time comes is that a legal document and is an attorney required to transfer my assets to include my house?” What can you tell Jason? Ed: To answer the first question, Jason, is as long as you have the capacity to make a will, meaning that you are of sound mind, sound body, there’s no undue influence, it is absolutely legal. In fact, I did some research on it. There have been some cases where people literally made their will out on a bar napkin and has been found to be valid. That part of the question is yes but you have some steps to make sure that you get sound mind, sound body, and you have testamentary capacity to make that document. I’ll let Greg handle the second part of the question. Greg Fellerman: Which is the transferring of the assets. So if you’re going to transfer a home, you’re going to need to prepare certain documents which are helpful to have a lawyer prepare those documents because you don’t want to have any bumps in the road with those type of documents. Because if you do prepare a deed and it’s not proper and you pass away, then there’s going to be an issue with the estate. The good news is we actually have some guys in our office now doing estate work so if you have questions on that we can really help people with that new type line of business. Dave: And sometimes in this realm, you see people that do make an error that could be prevented and it leads to big problems down the line. Greg: We always say take the time to prepare whatever we want to do because the wills and estate guys, they really know how to prepare the documents to do what you need to do. We always say, when people don’t do the preparation, it’s a disaster. Ed: It’s not advisable to put your will on a bar napkin. It’s just not. Dave: Could work but you could have some issues there. And don’t forget if you want to prevent any issues and talk to the guys, you can reach out on the phone or online. Results matter. Attorneys Greg Fellerman and Ed Ciarimboli. Thanks, guys.